one strand with another. Cut off all the remainders of the ends close up, then roll and pound the line so the tucks will settle in tight. 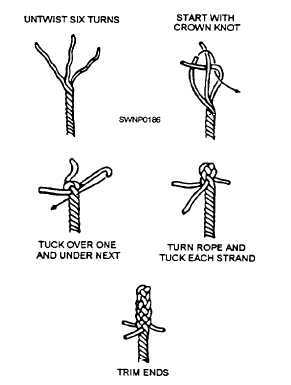 As soon as you have gone far enough with the first tucking end to have its end left to make an overhand knot and two tucks, stop and tie the ends together. This procedure must be done in the correct direction; the ends must stand out away from the standing part, not alongside. Now, select two more opposing strands from the marriage in the same manner as before. Be careful to pick the correct two strands. Proceed to unlay and replace (DOWN TIGHT) as you did the first pair-this time in the opposite direction. When the proper place is reached, tie a knot (view 3). You now have two opposing strands with which you have nothing to do but make an overhand knot. If at this point there happens to be a standing strand running between them, a wrong choice has been made in choosing opposing strands (pairs) during one of the first two steps. The solution is to bring one or the other of these first two back and redo it with the correct pair. When completed, the splice should look similar to the example shown in view 4. After all three overhand knots have been correctly tied, then start tucking all the loose ends over one and under one, twice each. Cut off all the remainders of the ends close up, then roll and pound the line so the tucks will settle in tight. When completed, the splice will look like view 4. In a BACK SPLICE, the strands at the end of a line are spliced back into its own strands. This splice is used to prevent a line from unlaying or unraveling when an enlargement at the end of the line is not objectionable. same principle as with the eye and short splice - over one and under one. Because the back splice leaves a lump in the line, it should not be used where there is a possibility of the enlarged end hanging up, as might be the case if it were run through hoisting blocks. Nylon line can hold a load even when many strands are abraded. Normal] y, when abrasion is local, the line may be restored to use by cutting away the chafed section and splicing the ends. Chafing and stretching do not necessarily affect the load-carrying ability of nylon line. The splicing of nylon line is similar to that of manila; however, friction tape is used instead of seizing stuff for whipping the strands and line. Because it is smooth and elastic, nylon line requires at least one tuck more than does manila. For heavy loads, a back tuck should be taken with each strand.